Getting a SkillSelect invitation is much more difficult this year compared to previous years. This is case for most occupations across the board, not just popular pro rata occupations such as accounting, IT and engineering. This article looks at SkillSelect trends for this year, reasons why it has become more difficult and ways to improve your chances. The Skilled Independent Subclass 189 visa is a permanent visa which you can qualify for based on your own qualifications, work experience and English language ability. It does not require sponsorship or nomination by a relative, employer or state/territory government and so is an attractive option for many applicants. You cannot apply directly for a Skilled Independent visa - you must first lodge an Expression of Interest (EOI) through SkillSelect and receive an invitation to apply. Invitation rounds are conducted every 2 weeks and the "best" applicants based on their score on the General Skilled Migration points test receive an invitation each round. For the 189 visa, you must nominate an occupation on the Independent and Family Sponsored Occupations List (IFSOL). Occupation ceilings are set at the beginning of the program year, which specify a maximum number of EOI invitations for each occupation on the IFSOL. The program year goes from 1 July to 30 June the next year. Some occupations are very popular and receive far more eligible EOIs than the occupational ceiling. These occupations are called "pro rata" occupations - a maximum number of invitations is set each round and so the required points may be higher or waiting time longer for these occupations. Most other "non-pro rata" occupations don't get anywhere near the occupation ceiling each year, and hence have a lower required points score for an invitation. For all previous years that SkillSelect has been in operation, 60 points has been sufficient to receive an invitation for a 189 visa, unless your occupation was on the pro rata list. This year, the required score has been at least 65 and for some rounds it has been 70 points for non-pro rata occupations. When looking at the overall number of invitations, there have been 10,375 invitations for 189 and 489 family sponsored visas issued, versus 12,021 to the same point last year. This is a reduction of 1,646 places or 13.6%. We understand that this may be due to places being reserved for the newly introduced New Zealand stream of the Skilled Independent 189 visa. There's only a small change in the number of invitations issued for pro rata occupations (a reduction of 121). Most of the reduction in places is flowing directly through to non-pro rata occupations. 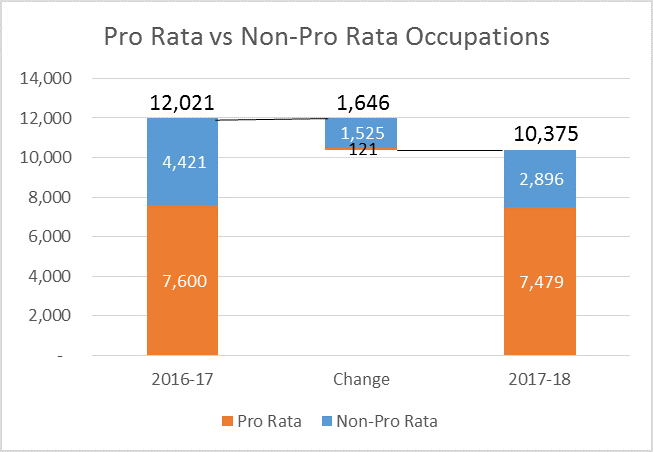 So far in 2017-18, there have been 2,896 invitations issued to non-pro rata occupations, versus 4,421 to this point last year - this is a decrease of 1,525 places or 34%. The lower number of available places makes the invitation process for non-pro rata occupations much more competitive. The overall number of invitations issued to pro rata occupations has not changed much - so why is it more difficult to get an invitation in these occupations this year? Accounting is one of the most competitive pro rata occupations and is a good illustration of what is happening. 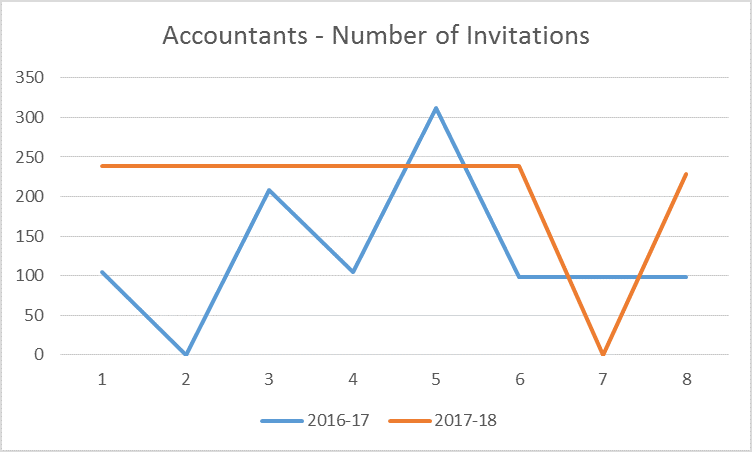 When looking at the overall number of invitations issued to accountants so far this year, there is a significant increase of 641 places or 64% compared to last year. This is consistent with the increased occupation ceiling. Contrary to expectations, applicants have required at least 75 points to receive a 189 invitation in 2017-18 versus 70 points last year. In the 20 September 2017 round, applicants required 85 points for an invitation as an accountant. What's happening here? It's clear from the above charts that there are a lot more EOIs with higher points scores than last program year. 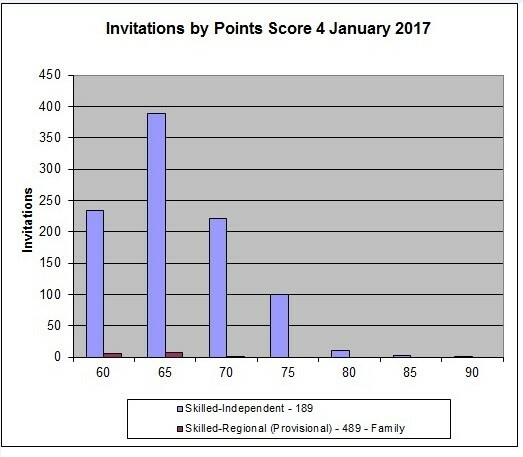 In the 4 January 2017 round, there were approximately 350 invitations issued to people with 70 points or more. 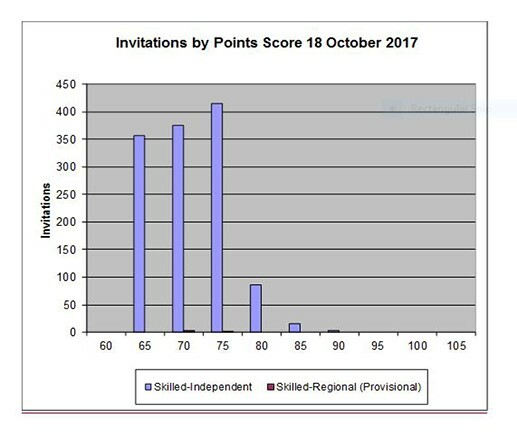 In the 18 October 2017 round, there were around 900 invitations issued to people with 70 points or more. About 525 people were invited with 75 points or more versus 115 or so last year. This is a massive increase - how can this be possible? Probably the most significant reason for the increase is that applicants are claiming more points for English language ability. It was previously unusual for applicants to claim full points for having superior English. Many applicants are sitting for the Pearson Test of English Academic in particular and getting the points for superior English. Even so, the increase in people claiming 75 points over the course of 2017 is staggering. This suggests other factors are at play. 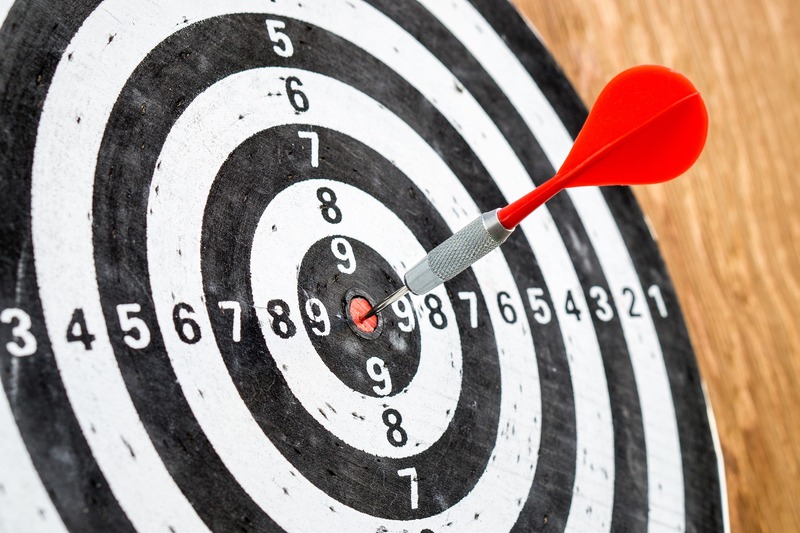 One possibility is that people are over-claiming points when they lodge their EOI. This may result in an invitation being issued, but to be granted a visa, you would need to be able to prove each of the points you have claimed. Failure to do so will result in refusal of the visa application, but there's nothing stopping applicants from "spamming" SkillSelect with EOIs which claim high points. 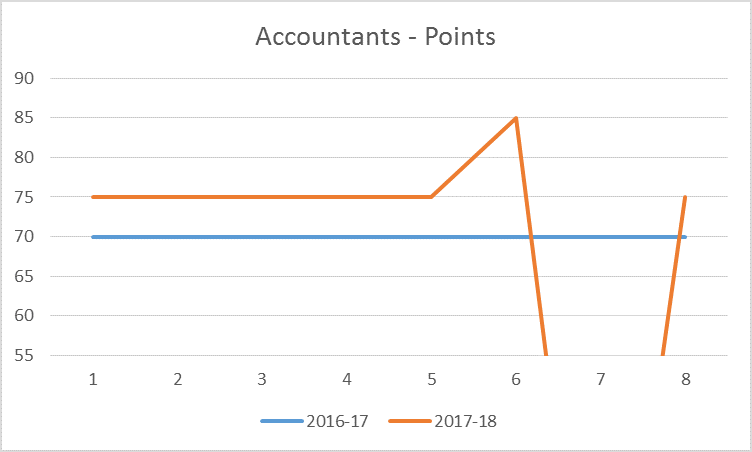 EOI applicants over-claiming points appears to have been the cause of the high minimum score required for accountants in the 20 September 2017 round. Immigration has conducted a number of "manual" rounds for accountants to ensure this does not recur, but there is the possibility that over-claiming is still happening in other occupations. Another possibility is that a single applicant may be lodging more than one EOI. There is no cost in lodging an EOI, and applicants can lodge as many EOIs as they wish. If the applicant has high points, they may be invited more than once. This will "use up" a number of places in the occupation ceiling which will then no longer be available to others. State Nomination: the state nominated subclass 190 and 489 visas are not subject to occupation ceilings and often 60 points is sufficient to qualify for these visa types. Getting state nomination may require a long-term plan but it is a good way to avoid the now very competitive subclass 189 visa. We have recently had some very good success stories with the 489 visa. Getting a state nomination for a 489 visa may be easier - and faster - than for other visa subclasses. The 2017-18 program year is by far the most competitive one yet for SkillSelect. These days, obtaining a SkillSelect invitation is the most challenging part of the General Skilled Migration application process. Using a migration agent may give you that extra edge you need to get your PR. If you would like advice on how to improve your chances of qualifying for General Skilled Migration, please book a consultation with one or our advisors.